Authored by St. Ignatius of Loyola, Translated by Fr. Elder Mullan S.J. 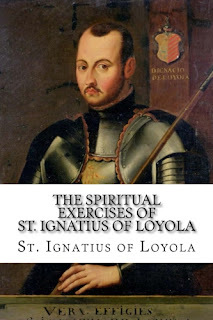 "The Spiritual Exercises of Ignatius of Loyola (Latin original: Exercitia spiritualia) (composed 1522–1524) are a set of Christian meditations, prayers and mental exercises, written by Saint Ignatius of Loyola... Divided into four thematic "weeks" of variable length, it is designed to be carried out over a period of 28 to 30 days. They were composed with the intention of helping the retreatant to discern Jesus in his life, leading him to a personal commitment to follow him. Though the underlying spiritual outlook is Catholic, the exercises can also be undertaken by non-Catholics. The "Spiritual Exercises" booklet was formally approved in 1548 by Paul III" - Wikipedia.